For the believer, the Holy icon is not just a picture, but the Holy blessed way. The honor of worship appropriate for the Board or dyes, not artfully written image, and directly to the person, to which man turns in your prayers. To venerate the icons is with a special sense of awe and reverence, realizing that this is not just a portrait of a Saint or his iconic likeness, and a great Christian Shrine, given to man for spiritual solace. Before applying to the Holy way prayer is necessary to refer to the person depicted in it. You can pray as your word is necessary and a brief Church prayers. For example, having kissed the icon of the Lord, you can pray the words of the forgiveness of sins, to the virgin Mary - to seek salvation ("most Holy Theotokos, save us"), the angels and saints to ask for prayers to God ("Holy (name) pray to God for me"). To venerate the icons should not only with prayer, but also after the imposition of the sign of the cross. Before the Holy image, is the sign of the cross twice with the words of prayer, then kiss the Shrine and kiss her forehead, to move aside, and once again impose the sign of the cross. 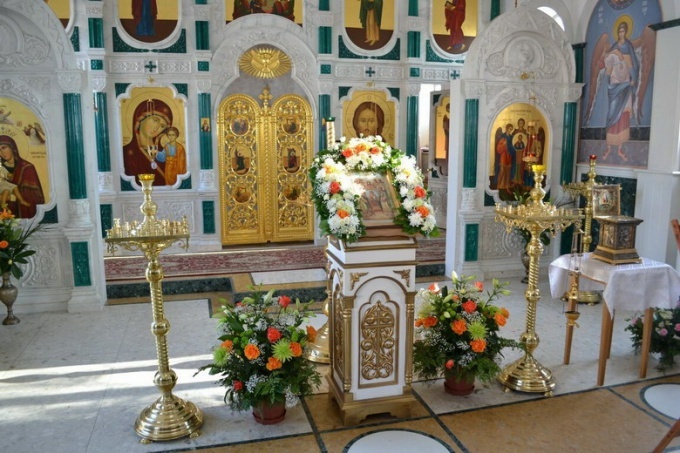 There is a custom before the miraculous icon to make three bows to the ground. The sequence is the same. In the case of a large queue, you can do prostrations advance in the direction of the icon so as not to delay other people. Kissing the Holy icon, you must know that indecent lips to touch the lips of the mother of God, the Lord, the saints or angels. It is unethical and blagogoveyno. The icons of the Savior, depicted in full growth, you should kiss the feet or the edge of the garment; the icon where the Christ is depicted waist - - kisses the hand or the edge of clothing. The same rule befits and icons of the virgin, saints and angels. If the lectern is the image of Edessa, which shows only the face of Christ, it should be applied to the edge of the hair of the Lord. The people there are practice applications to icons hands. At first kiss the hand itself, and then apply it to the Shrine. This practice is not entirely appropriate in the Orthodox Church. Also pay special attention to the fact that it is impossible to venerate the icons, women, lips which are dyed. In kissing the icon can be traces of lipstick. Therefore, the girl before to the Shrine you need to wipe your lips.